In a recent article I looked at the relationship between RPD and utilization when used as car rental KPI. The conclusion was that given the pricing structure, i.e. 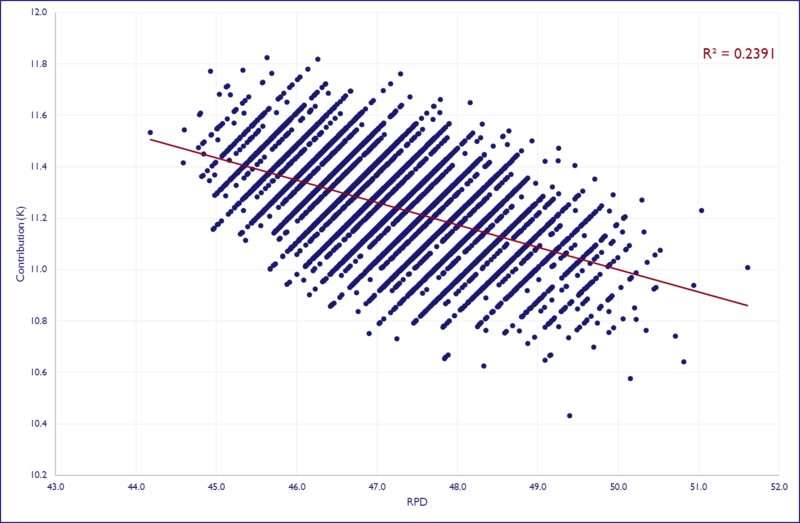 indexed RPD as a function of rental length, in the European car rental market, one has to make a choice with regards to which one to maximize. The article did not, however, go into detail regarding which is the better KPI measured by operational and financial performance. What matters to stakeholders of an organization is value creation, for which profitability can be considered a proxy. The “best” KPI can accordingly be deemed to be the one generating the highest profit. With that in mind, is one of the two aforementioned car rental KPIs better using this as a selection criterion? As is often the case, the short answer is « it depends ». In this case it largely depends on the transaction cost for the operator, i.e. everything related to what happens between two rentals, e.g. cleaning, damage checking, admin etc. Depending on the cost structure in place, focusing on utilization may make sense in some cases whereas pricing may be more appropriate in other cases. This article explores the issue of car rental KPIs and profitability in more detail. 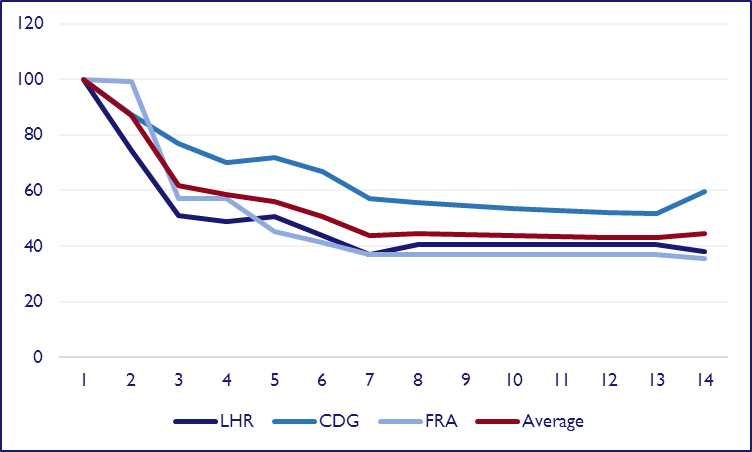 There is evidence of an indexed pricing curve in the European car rental market as a function of rental duration. Based on a sample of quotes from five major operators (Avis, Enterprise, Europcar, Hertz and Sixt) at three major airports (London Heathrow, Paris Charles de Gaulle and Frankfurt), indexed daily RPD for various rental lengths is shown in Figure 1 (RPD for a 1-day rental equals 100). 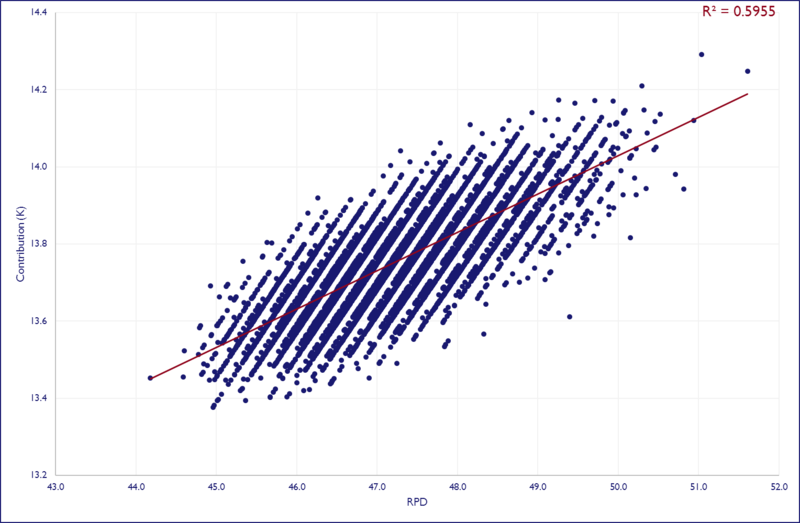 To see if there is a trade-off to be made between RPD and utilization, a Monte Carlo simulation was performed. 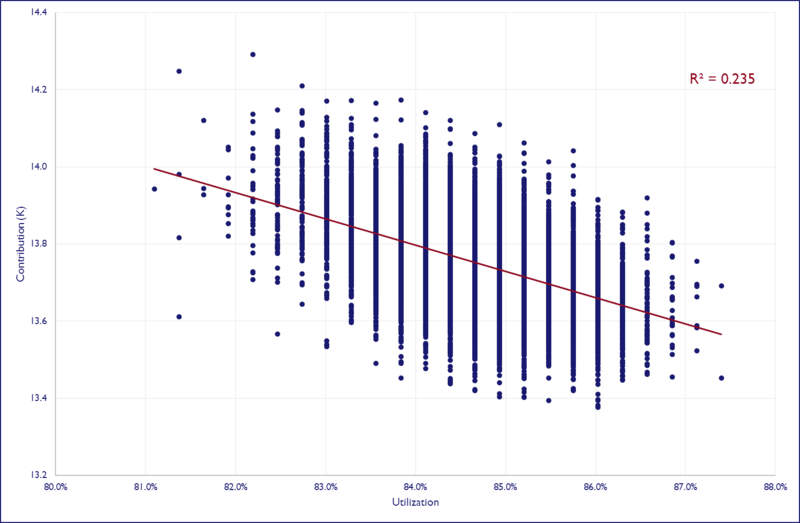 As seen in Figure 2 there is clear evidence of a negative relationship between RPD and utilization, which implies that it is futile to aim to maximize both at the same time. Assuming that profit maximization is the ultimate objective for an organization, is one KPI better than the other in order to achieve this? If yes, which one? There are two parts to operational profitability, revenue and expenses. 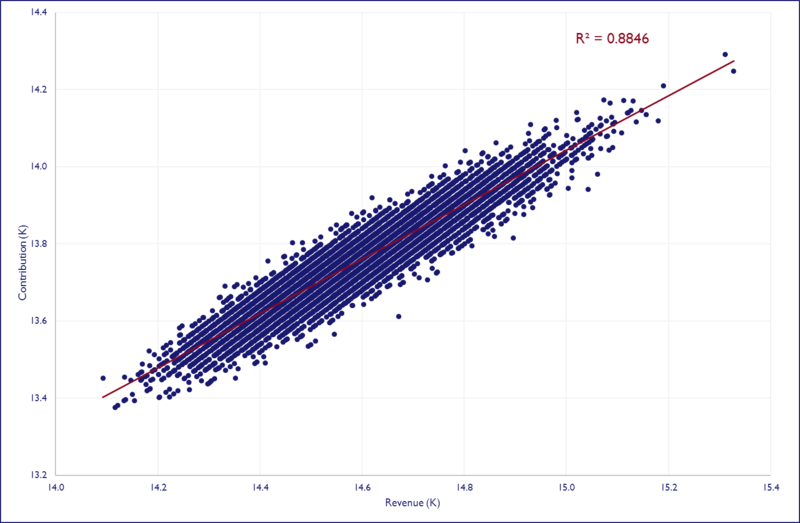 Revenue is straightforward to calculate based on the aforementioned hypothesis whereas the expense side depends on individual parameters in an organization. Accordingly, for the purpose of this analysis various cost scenarios have been considered in order to get a range of outcomes. A simplifying assumption used is that the only variable cost is direct transactional costs (washing and cleaning of cars, allocated counter personnel cost, admin etc), all other operating expenses, both fleet and non-fleet related, are considered fixed and independent of the number of rentals and their length. In short, the analysis focuses on direct contribution from transactions. As would be expected, contribution is dependent on the direct transaction related costs. In general, the higher the direct cost of a transaction is, the more attractive longer rentals become, whereas lower transaction costs favor shorter rentals. 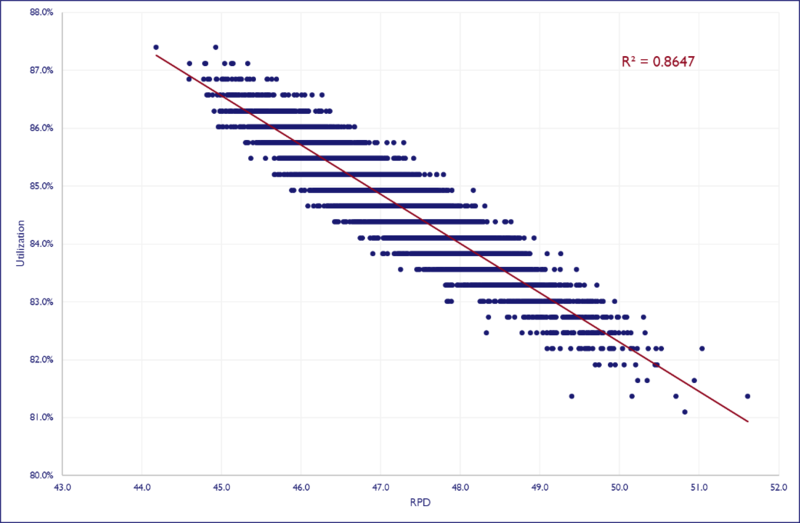 It is worth noting, however, that there is not a linear relationship between rental length and contribution, a consequence of the non-linearity of the pricing curve across rental durations. The first question to ask is what generates revenue, RPD or utilization? 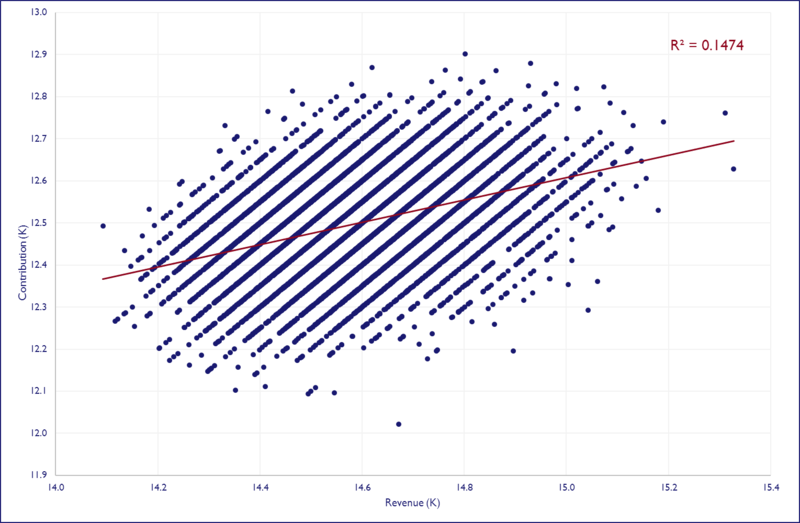 Figures 3 and 4 look at the relationship between revenue and either variable and the evidence clearly points to pricing as the key driver. There is a positive relationship between RPD and revenue generation. 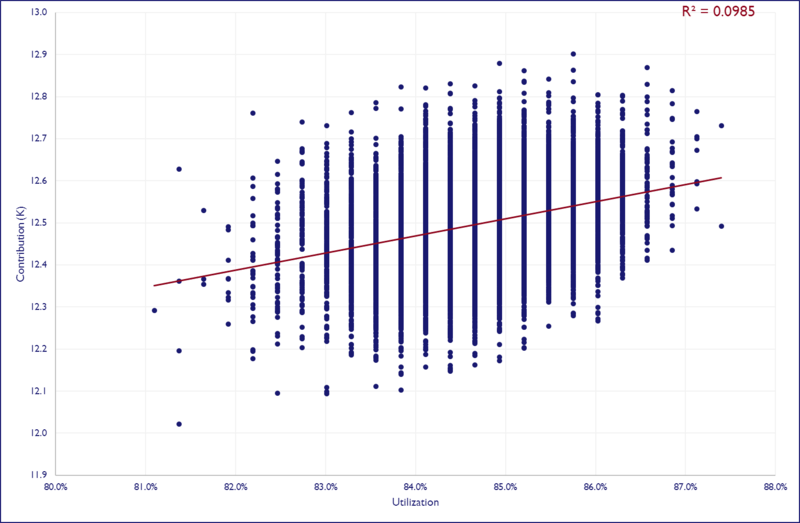 Unsurprisingly, given the previously established negative relationship between RPD and utilization, there is a negative relationship between utilization and revenue, i.e. 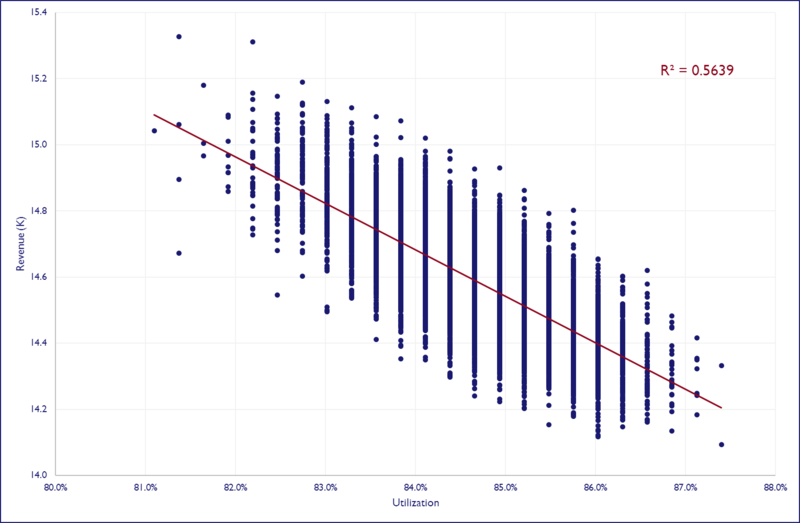 the higher the utilization, the lower the revenue generated, an explanation for which is lower average RPD. Revenue only tells one part the story and is not necessarily a reflection of profitability. Accordingly, costs and expenses have to be factored in to consider the quality of the revenue in terms of contribution. As explained earlier, the only expenses considered relevant are direct transaction costs, which is why the term contribution is preferred. Three scenarios have been considered with direct transaction cost at 20 (low cost), 50 and 80 (high cost). All figures should be considered as assumed RPD for a 1-day rental of 100. The cost hypothesis is based on the assumption that a 1-day rental should have a positive contribution. Revenue is a constant for each scenario, i.e. the only difference is the cost structure. Figures 5 through 16 summarize the findings in each scenario. This represents a low cost scenario. 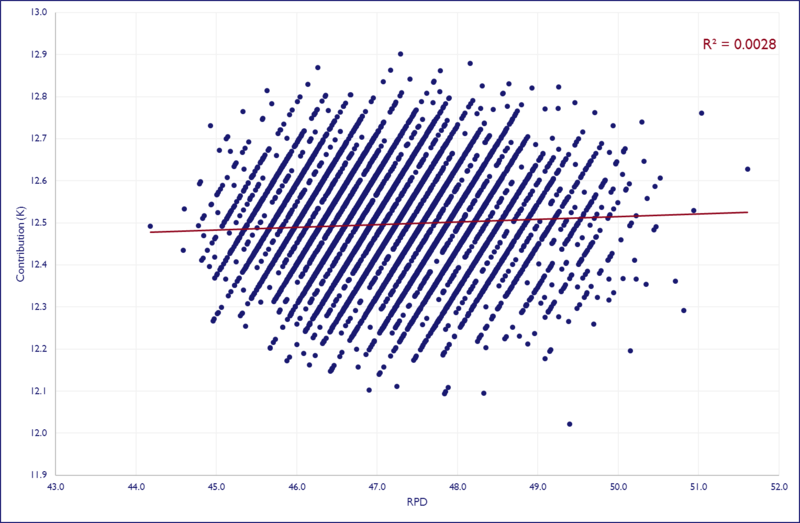 As seen in Figures 5 through 8, short, high RPD rentals are favored in this case and there is clearly a negative relationship between utilization and contribution. Given the positive relationship between revenue, RPD and contribution level, operators with a cost structure at this level should focus on short, high level RPD transactions to maximize contribution. 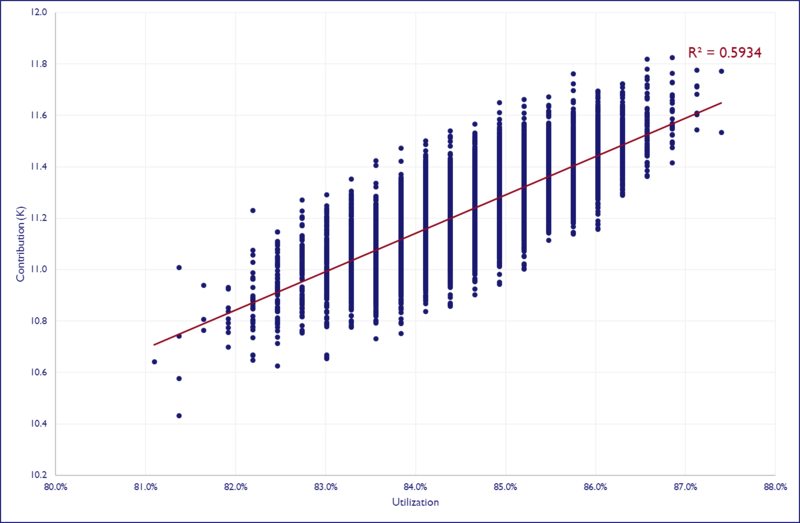 Utilization should not be a priority in this case as the data suggests that incremental utilization is contribution destructive. In the mid-level cost scenario there is no clear response to whether RPD or utilization should be the priority, nor which one generates the highest contribution. 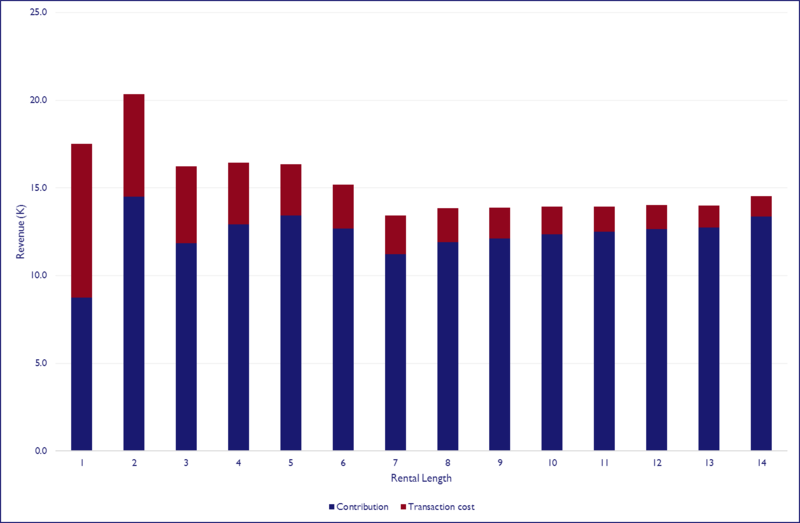 Assuming that all rentals are of equal length, focusing on 2-day rentals would maximize contribution (figure 9). 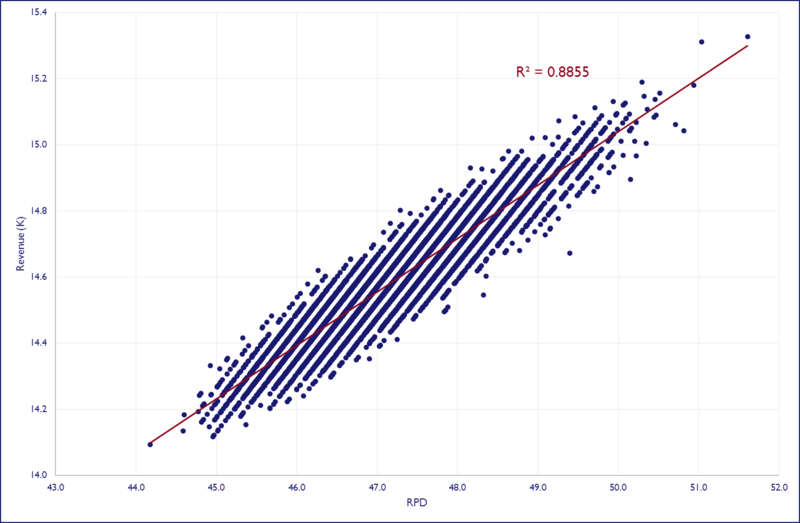 The Monte Carlo simulation is, however, inconclusive in that there is a rather weak relationship between both RPD and utilization and contribution expectations, as seen in figures 10 through 12. Whereas the relationship between RPD and contribution is close to neutral, there is evidence of a slightly positive relationship between utilization and contribution. Thus, longer average rentals, implicitly driving higher utilization, may be considered a priority. 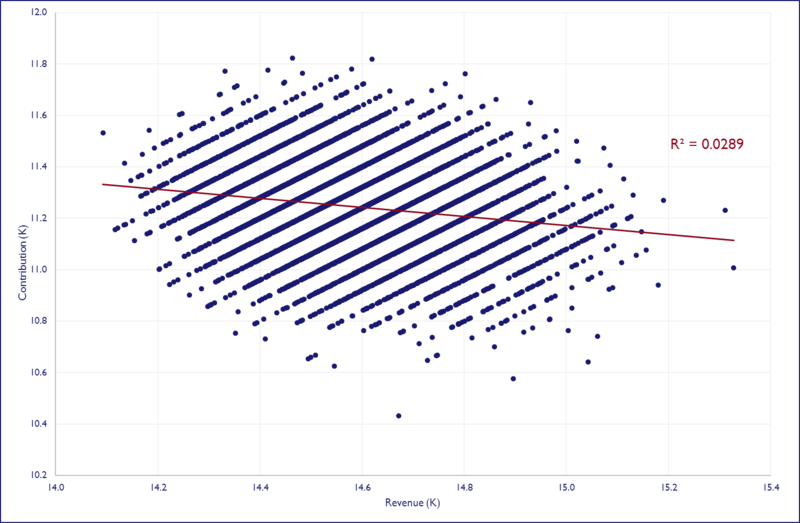 However, another interpretation is that revenue is more correlated to contribution, see Figure 10, and, as seen in Figure 3, RPD has a positive relationship with revenue, one can argue that RPD should be the focus. For operators at this cost level, the evidence is not clear-cut and as such it may become more a subject of personal sentiment and preference with regards to target KPI. This represents a high cost scenario and the immediate observation is that short, high RPD rentals are not really contributive. Accordingly, the most appropriate would be to focus on utilization, i.e. longer rentals, to leverage the positive relationship between utilization and contribution, as observed in figures 13 through 16. Based on the available evidence, operators with a high cost structure clearly should focus on utilization as a KPI as longer rentals allow for spreading the transaction costs, which becomes fixed once a transaction is executed, out over a longer period. For car rental operators a key takeaway is that there is clear evidence of the need to make a trade-off between RPD, a proxy for pricing, and utilization. The choice of target KPI, assuming it is limited to the aforementioned two, is not without importance as it potentially has a significant impact on operational contribution and profitability levels. Depending on the direct cost of each transaction, utilization (high cost scenario) or RPD (low cost scenario) would be the most appropriate. In an environment where pricing is major concern and utilization is considered a potential panacea, this should not be disregarded. As an end note it is worth keeping in mind that the presented findings are based on theoretical examples and should be considered and used as such. However, the basis for the analysis, i.e. the duration based pricing curve in the European car rental market, is a real, market based observation. This should be taken in to account by car rental operators when looking at their strategic direction and options, when deciding what segments to focus (Leisure rentals on average tend to be longer than Corporate rentals) on and when setting a pricing strategy (should be coherent with chosen segments and cost structure). This article is available for download here.